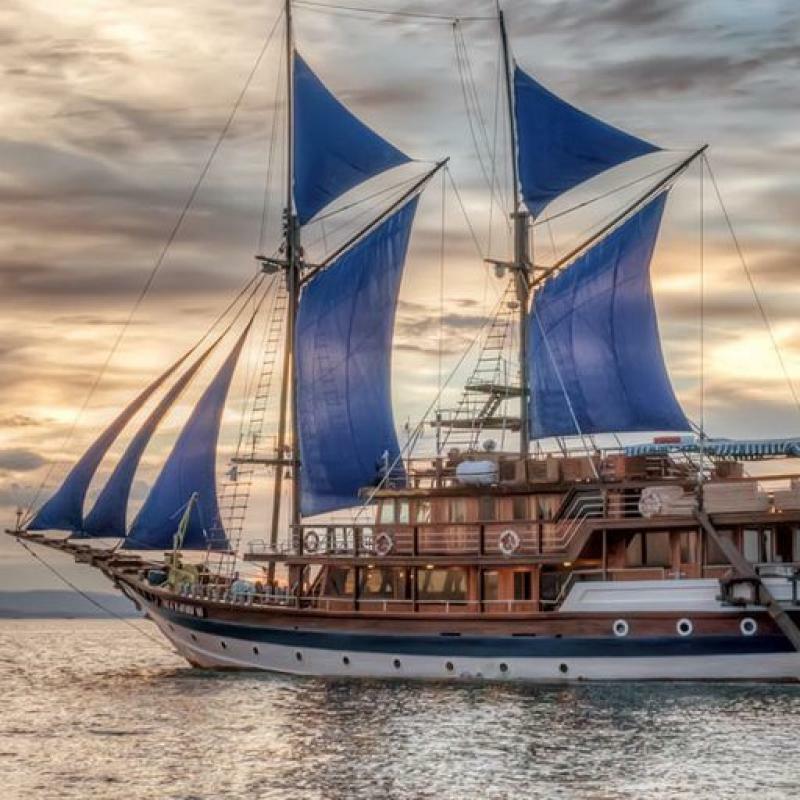 Le Duyung Baru est un bateau de croisière traditionnel indonésien de 27 mètres de long offrant pour un prix abordable de magnifiques séjours de luxe. Avec ses 3 cabines pour une capacité de 6 personnes maximum, c'est le bateau idéal pour les petits groupes, les familles, ou même les voyages privés. Il est affrété et géré par ses deux propriétaires, un Allemand et sa femme indonésienne. Ensemble, ils organisent depuis 1998 des croisières dans les eaux indonésiennes et en particulier au Parc National de Komodo. Ils font partie des opérateurs les plus expérimentés de la région. Le Duyung Baru offre le meilleur rapport qualité / prix de Komodo et vous offrira un séjour intime et personnalisé ! Dans la luxueuse salle à manger, vous pourrez savourer chaque repas préparé avec amour par la propriétaire : il vous sera servi des recettes authentiques d'Indonésie et du Japon ainsi que de la cuisine occidentale. Vous pourrez également profiter entre les repas de fruits frais et cookies maison. Après la plongée de nuit, des douceurs vous attendront à bord (gâteau à la banane, cheese cake, pudding, et même des noix grillées pour ceux qui prendront un verre après leur plongée). Si vous êtes végétarien ou si vous suivez un régime particulier, il vous suffira de le préciser à l'avance et le chef vous préparera des plats adaptés. Le Duyung Baru compte 3 spacieuses et luxueuses cabines conçues spécialement pour vous assurer un confort optimal. Elles peuvent héberger jusqu'à 6 personnes par séjour. Toutes les cabines sont meublées de superbe tek poli à la main. Chacune dispose de la climatisation individuelle, d'une douche d'eau chaude privative, de serviettes et de toilettes. Les cabines sont nettoyées tous les matins pendant que vous profitez de votre première plongée de la journée. 2 cabines doubles : Equipées d'un lit double queen-size, d'un bureau, d'un coffre et de deux fenêtres. 1 cabine Twin : Equipée de deux grands lits simples, d'un bureau, d'un coffre et de deux fenêtres. Une plongée nocturne par séjour. Nitrox: Disponible, en supplément (7.50EUR par bouteille, package Nitrox 100EUR pour 7 jours, 125EUR pour 9 jours). Blocs 15L: Disponible, en supplément (7EUR par jour). Location d'équipements: Disponible, en supplément (20EUR). Assurance de plongée: Les plongeurs doivent avoir une assurance valide. Pourboires de l'équipage: Non inclus, une moyenne de 35EUR par personne est recommandée. 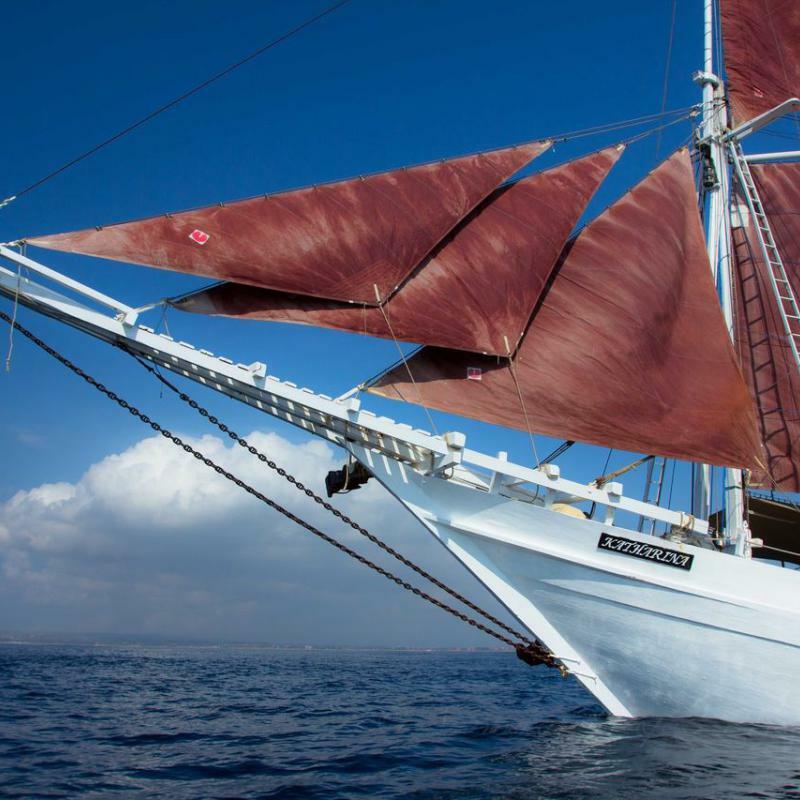 Autres activités: Pêche et PMT (Palmes / Masque / Tuba) inclus, excursions (Komodo dragon tour) incluses, excursions au port et dans les parcs nationaux disponibles, en supplément : Komodo (145EUR pour 7 jours, 175EUR pour 9 jours), Sulawesi (95EUR), Wakatobi (190EUR). Aboard the Duyung Baru we always want to provide the best scuba diving destinations possible. 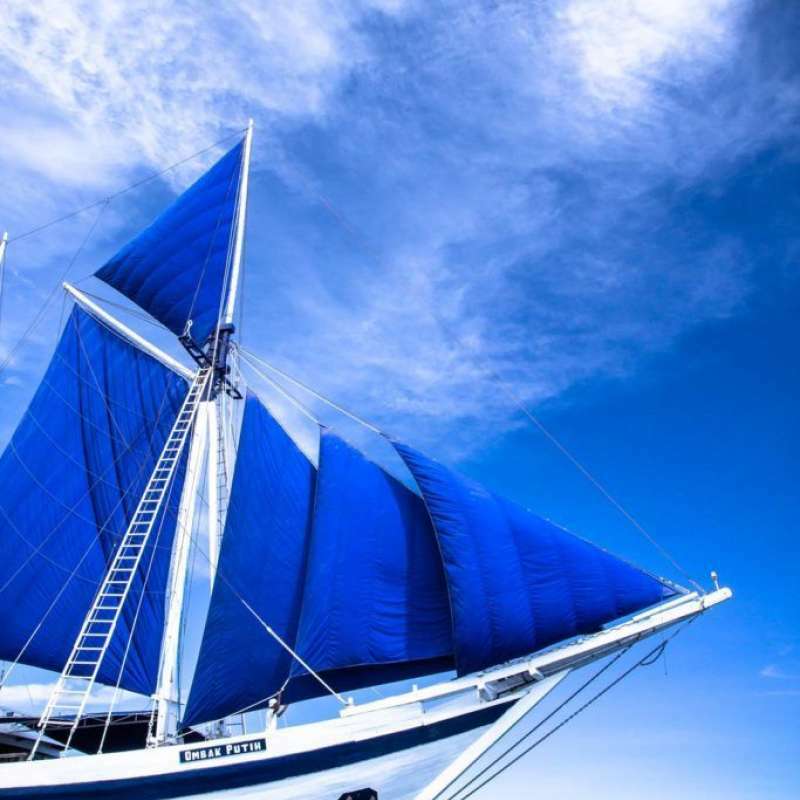 Meaning that the waters that the Duyung Baru sail upon are truly world class. We are currently operating within the Komodo National Park, Selayar and our newest untouched virgin coral dive destination, Wakatobi! The waters of the Komodo National Park are not easy to predict, they require an extensive knowledge of tides, currents and surface water movements to know exactly where to drop. Get it wrong and you will miss the critical point where the currents split and all the highest intensity action is to be observed. Luckily for us, our Dive guide and cruise director ‘Vovo’ brings a wealth of experience to his position. With over 8000 dives within the Komodo National Park alone, Vovo will bring you along to the most impressive dive sites including the legendary Batu Bolong, Golden Passage, Castle Rock and The Cauldron just to name a few. At these sites we can hope to see Giant Trevalley hunting schools of baitfish, Eagle rays, Manta rays, Napolean Wrasse, Bumphead parrot fish plenty of tropical corals, white and black tip reef sharks and huge varieties of tropical reef fish! We also encounter brilliant dive sites for Macro diving where all the small critters you can imagine are waiting to be found. Perhaps the most exciting part of 2015 for us was exploring the waters of Wakatobi. We found ourselves in the middle of a vast array of untouched virgin coral reefs and absolutely no other scuba diving liveaboards operating in the waters. Due to this we are now currently organising charters to this destination throughout November and December of 2016 and 2017. Wakatobi is a new destination for the Duyung Baru. Located near the southern tip of Sulawesi in the Banda sea, we stumble upon four pristine exotic islands: Wangi-wangi, Kaledupa, Tomia, and Binongko. Using the first letters of the four main islands we have the name- Wakatobi. Wakatobi is located at the world’s epicenter of coral reef biodiversity and is designated a UNESCO Marine Biosphere Reserve. Of course this means that while diving at Wakatobi we see a great variety and diversity of marine life. We not only see beautiful vistas, untouched virgin coral reefs, and large healthy soft corals, but also an abundance of colorful reef fish and rare and unusual cryptic ‘critters’. New and undocumented species continue to be discovered at Wakatobi year round. Wakatobi is a photographers dream. Crystal clear waters, little currents and great light combine to produce world class diving conditions. Exotic and rare marine life can be found on all dives. The Duyung Baru will moore in a secluded calm bay and from there we travel by speedboat to the various dive sites of the islands. There is a variety of diving to be completed from sheer dropoffs and caves, to the shallower reefs perfect for wide angle and macro photography. On our Wakatobi Liveaboard charter we will make several dives at the best locations on each of the four islands. Wakatobi is definately one of the most interesting and relatively unexplored dive destinations left in the world. We truly believe this is an opportunity not to be missed out upon. In future years there is predicted to be a large rise in tourism in this area, the result of this, sadly, is that these virgin corals may not be so undistrurbed. Our wakatobi liveaboard is truly an opportunity to be apart of and you will be treated to an underwater world that not many poeple in the world will ever have access too while it is still in this pristine condition. Duyung Baru is currently also running combination tours, where we split our time between Komodo and Wakatobi. If you are interested don’t hesitate to send an email inquiry. The Komodo National Park is made up of the Komodo Island as well as many small and medium sized islands including Rinja, Padar,Tatawa and Sabayor. The Komodo underwater currents can make diving “tricky” but for more experienced divers, exciting and great fun. There are dive sites suitable for all levels of diver, from experienced open water diver and above. However there is no doubt that the largest shoals, the biggest fish, the most sharks and generally the most exhilarating dives are where the currents are at the strongest. Therefore I would suggest to get the best out of the area. The diving is not for newly qualified or inexperienced divers or for divers who are not capable of a bit of hard fining on some occasions. From June to September the surface water conditions are best and on many days, flat and completely calm. Visibility is great, anything from 15 – 40 meters. Water temperature varies from 24 – 31 degrees C, depending on the tide. For maximum comfort in the water we would suggest that you wear a quality 5mm thick wetsuit. Wetsuit boots and open heeled fins are also preferable. We would also recommended you bring a reef hook, D.S.M.B., whistle, torch and all the usual extra accessories for diving in remote locations. All of our dives will be guided by the knowledgeable, experienced (20 years operating within the park) and enthusiastic PADI Divemaster- Vovo, ably assisted by his boatman and komodo currents “guru”, Merajap, who has been navigating these waters since he was a child. He seems to be able to read the oceans like a book. The Duyung operates from Labuan Bajo, the garden city on the island of Flores, which can be reached by a one hour flight from Bali (or a four day boat journey from Lombok. I spent a week w my husband on Duyung Baru. This boat is beautiful and caters to four to six guests at a time. I quite enjoyed the small amount of guests and we were lucky to have a fun group of people. The boat is very comfortable with places to lounge, sun tan and star-gaze at night. You have everything you need in your cabin for a great stay! Yani's cooking is well-documented and lives up to its reputation! The meals have a tasty, home-cooked quality, made with love no less! Sitting together for meals made for a nice and warm atmosphere. The crew is discreet yet efficient. I very much appreciated the opportunity of choices and options that you get diving with a small and experienced group. Vovo asked us what we wanted at the start: currents, macro, dragons (or not! ), mantas, etc.... and he made our wishes happen! This boat is tailored for experienced divers who do not require 'hand-holding' of their guide or a set, cookie-cutter itinerary ---I felt good not just being a number, having dived medium and large liveaboards in the past. If you want a relaxed diving experience in Komodo, then consider Duyung Baru!